First a little history of My family's clan origins My Name is Shaun Kelly. These scripts are DIRECTLY translated from the Annals of Ui Maine, The Annals of Connacht and the Annals of the Four Masters and transcribed to suit modern english from Old Irish Gaelic. 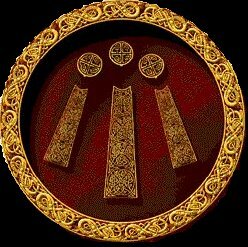 Clan Kelly originated from the ancient name name O'Kelly or in Gaelic O'Caellaigh. Another powerful federation of tribes was the Ui Maine (O'Kelly) whose extensive territory embraced large areas of what is now south Roscommon, Galway and north Clare. According to O'Rahilly, the Ui Maine were pre-Milesian Celts who were later given a Milesian pedigree. Descended from the Celtic High Chief of the Ui Maine, Maine Mor, son of Eochu, etc. Not withstanding their importance, O'Rahilly points out that they were vassals who paid tribute to the Milesian kings of Connacht. Among the Ui Maine dwelt the Sogain, a Cruthin (Pict) tribe, and the Dal naDruithne believed to be Tuatha De Danann Celts. I have traced my roots back to the sub sept of Dal naDruithne whom are recorded as being primarily a clan of Druids. The Other sept were Pictish or Pictii. The Ui Maine was reportedly founded by the brother of Fiacha Straivetine, King of Ireland, A.D. 285, whose original territory comprised parts of what are now the counties of Galway, Roscommon, Clare, and Offaly. Irish annals tell us that the Ui Maine kingdom gained its name when its 4th century leader, Maine Mor, conquered a territory of southeastern Connaught from the Firbolgs and settled there in 357 A.D.
About the 5th century (357AD), a northern tribe moved into East Galway; they are said to be descended from Colla da Cr�och (one of the Three Collas ), as stated in O'Kelly genealogy. They occupied an area around Ballinasloe and Creagh takes its name from them. One of their chieftains was called Maine Mor and, from then on, they became known as U� M�ine, or HY-Many. A different "Ua Maine" genealogy is descended from Conn of the Hundred Battles, e.g. Maine, a quo Ui Maine, m. Echdach m. Domnaill m. Fiachach Sraiptine m. Carpri Lifechair. Another separate Ui Maine genealogy descends from Oengus Dub, grandson of Catha�r Mor, of the Ua Failge sept of Leintser. Still another genealogy is cited as Maine, son of Niall [of the Nine Hostages], a quo Ui Maine & Fir Thethba. The O'Kellys, O'Donnellans and O'Maddens were prominent septs of the Ui Maine. The O'Kellys (O'Caellaigh) were over-lords in the territory of Hy Many. The O'Donnellans claim descent from Domh�llan, lord of Clan Breasail. The O'Maddens (� Madadh�in) held territory in Co. Galway next to the Shannon and extending over the river in Offaly. The Romans called this pre-Celtic people Pictii, or "Painted," who (as claimed by many historians), actually tattooed or painted their bodies with designs of a brilliant blue with paint from a plant called woad. To the non-Roman Celtic world of Scots and Irish and the many tribes of Belgic England and Wales they were known as "Cruithni" and for many centuries they represented the unbridled fury of a people who refused to be brought under the yoke of Rome or any foreign invader. Porten Defendere ex Magicus extare mea servare mea in findem recipere mea expellare APAGE TE! Click Here to Join the HallsOfAvalon.com Banner Exchange! All content created by someone other than myself contained herein have been used with the expressed permissions of the original artists and/or authors. All content within this entire site is owned by Shaun Kelly and the Kelly Family. Any violaters will be subject to copyright infringment laws. If anyone wishes to post any information, quotes or graphics etc. contained in my site on the internet in any way shape or form, simply email me with the details.